Summary: In 1943, as Hitler continues to wage war across Europe, five college students and their Philosophy Professor, mount an underground resistance movement in Munich. Dedicated expressly to the downfall of the dictatorial Third Reich war machine, they call themselves the “White Rose.” Its sole female member, Sophie Scholl, who is twenty-one-years-old, and her brother, Hans, and Christoph Probst, their fellow underground resistor, are captured and imprisoned during a dangerous mission to distribute anti-Nazi pamphlets on campus at the university they are attending in Munich. Other fellow students and resistors are also arrested. 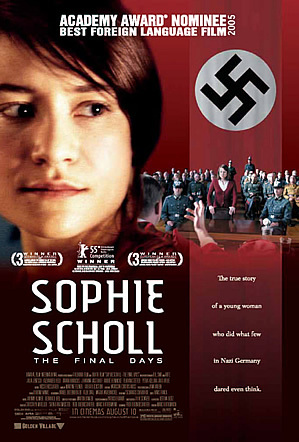 Sophie, unwavering in her beliefs that Hitler should be stopped and the Fascist party held responsible for millions of deaths, is cross examined for three days and then convicted with Hans and Probst on the fourth day for treason instead of the court ruling of waiting 99 days before punishment. The Gestapo wanted to eliminate the underground students resistance movement and quickly thwart the “White Rose’s” influence before other students joined the rebellion. Sophie’s cross-examination by the Gestapo escalates into a searing test of wills as she deliveres a passionate call to freedom and personal responsibility not to incriminate her friends, that is both haunting and inspiring. The three students are beheaded the afternoon of their trial. In post-war Germany, Sophie is remembered and revered as one of the few heroes who tried to stop the injustices of Hitler’s Fascist regime.